Clocks are full of all sorts of numbers, which does the job perfectly fine. Except that it’s pretty boring to always read time the same old way. Instead of just glancing at numbers, you can read the words. It’s the perfect gift for the wordsmith or scholar in your life. After all, normal clocks are much better suited for the mathematicians of the world that actually enjoy staring at numbers. 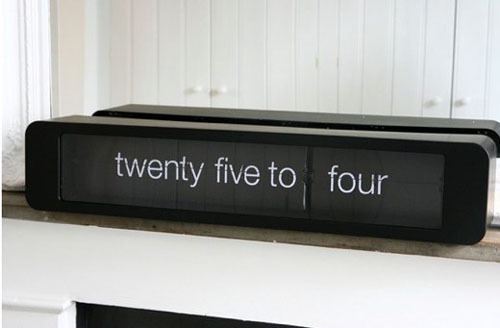 The clock states things in 5 minute intervals. It states things like “five to three” and “three o’ clock”. It just flips through all of those words to give you the proper time. It only comes in the black shown here, so hopefully you’re a fan of black and white. Unfortunately getting everything spelled out for your comes at a cost. 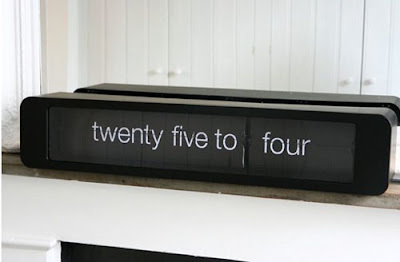 You can purchase the Flip Clock – Time Talks for £299.00 or about $454 through Rockett St George.